Argan oil is also known as liquid gold,argan oil is extracted from kernels of argan tree which is found in morocco.It contains essentials fatty acids and vitamin E which is good for skin and hair health. It is often used as a moisturizer to hydrate and softens skin.It will give natural glow to skin, gradually reduces the appearance of fine lines and wrinkles. Argan oil is for its benefits as a hair oil,it will nourish scalp makes hair softer,silkier and shiner.It can even help to treat spilt ends and tame frizzy hairs. You can make your own organic serum with argan oil due to its non sticky properties.All you need to have a spray bottle,this practice will eventually gives you a manageable hairs with shiny texture. It will give a youthful boost and glow to your skin and reduce the early signs of aging.It restores elasticity and will give you a celebrity glow. Pomegranate seed oil is extremely nutritious and rich, which is used internally and externally for cosmetic and medicinal purposes. The regenerative properties of pomegranate oil make it an indispensable ingredient in many skin care products. It is included in most cosmetics formulas like soap, shower gels, massage oils, moisturizer and other skin care products. It is also used as a vaporizer and a diffuser. It is mainly composed of Sabinene, Mycenae, Limonene, Alpha Pinene and Terpinenol. Only a meagre amount is needed to achieve positive results. Pomegranate seed oil is also used for massaging. Pomegranate seed oil is often included in the anti-ageing creams. The regenerative properties of the oil erase the visible signs of ageing to make you look your best. Just like pomegranate fruit, its oil is also prized for its antioxidant properties. It helps with collagen production, firming the skin. Pomegranate oil stimulates blood flow to the root of the hair. This enables the hair follicles to receive proper nourishment, accelerating hair growth. Pomegranate oil is a good source of vitamin C, a nutrient that is imperative for the health and growth of the hair. It strengthens the connective tissue within the hair follicles, stimulating hair growth. 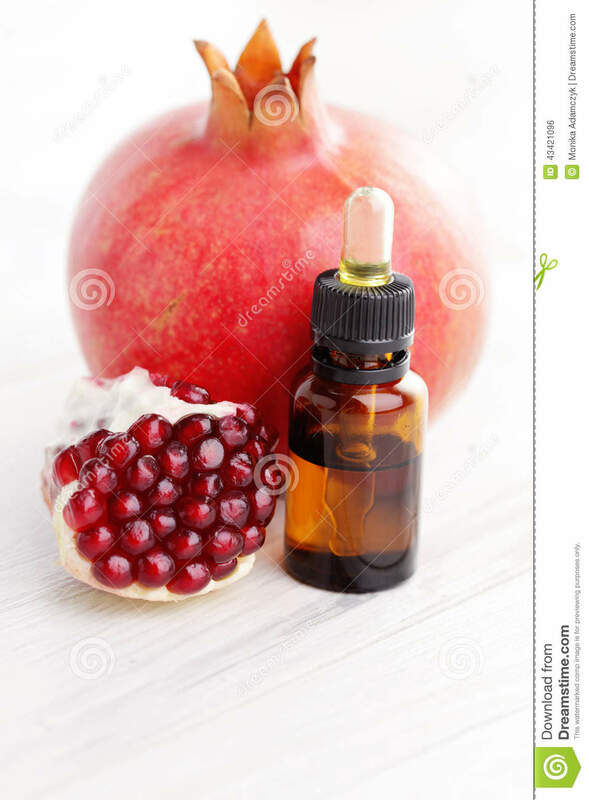 Pomegranate seed oil acts as an effective hair tonic when mixed with a carrier oil like castor oil, coconut oil, almond oil and even Vitamin E oil. Clary sage is extracted by steam distillation from the buds and leaves of the clary sage plant whose scientific name is Salvia sclarea. It is an herb believed to be a native of Europe, which has been highly praised as a medicinal plant throughout history, particularly owing to its numerous benefits that improve vision health. It is a close relative of common garden sage but has a slightly different makeup. Furthermore, you may be familiar with it as “muscatel oil”, a common name given to clary sage essential oil due to its traditional use of flavoring muscatel wine. Aromatherapy uses the power of scent to calm the mind and reduce feelings of ANXIETY.Your olfactory system directly affects the part of your brain that regulates emotion. That’s why what you smell can trigger memories and elicit feelings, both negative and positive. When used in aromatherapy, clary sage oil can help alleviate stress by inducing a sense of well-being. One small study done on women undergoing a stressful medical test indicated that when inhaled, clary sage essential oil elicited feelings of relaxation and helped to reduce blood pressure. Clary sage oil in diluted form may have a positive impact upon some strains of bacteria. Researchers think it could be an effective treatment alone or in addition to traditional treatments for wound care. In one laboratory study, clary sage oil helped heal severe dermatological infections caused by several strains of Staphylococcus bacteria. The lab study used swabs from the bacterial infections of 61 people. Each had a difficult-to-treat wound that wasn’t responding well to antibiotics. The wounds were caused by burns,diabetes or surgical procedures. Diluted clary sage oil was found to be effective against several bacterial strains. Clary sage has been tested on both animals and humans to determine its potential benefits as an antidepressant. One study done on rats indicated that clary sage oil could be beneficial for depression by acting as an anti-stressor. Another small study with menopausal women indicated that inhaled clary sage oil reduced cortisol, the stress hormone, and produced an antidepressant-like effect. One component of clary sage oil is sclareol, which mimics the effects of estrogen in the body. 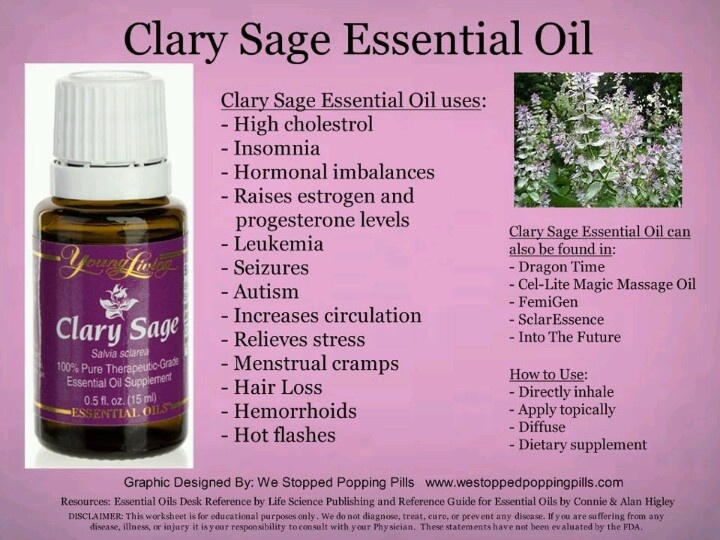 For this reason, clary sage may be effective at reducing some of the symptoms of menopause. Some research suggests that diluted clary sage oil applied to the bottoms of the feet can reduce hot flashes. A small study examined 48 women who experienced painful menstruation and cramps. Some of the women were given a cream containing clary sage oil and other essential oils to apply onto their lower abdomens daily, between menstrual cycles. The women who used the cream had a significant reduction in menstrual cramps than the control group. Peppermint oil is more effective than minoxidil! As a hair loss treatment peppermint essential oil is 60% more effective than minoxidil and with no adverse effects? 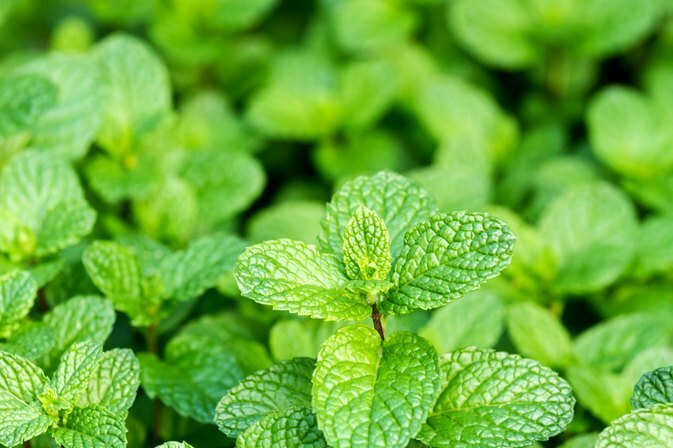 Peppermint is a plant hybrid of spearmint and watermint. Due to its cooling effect, it’s used commonly in the temporary treatment of muscle and nerve pain, as well as in the relief of itching. Peppermint essential oil has a variety of properties that make it an excellent addition to anyone’s hair growth routine. However, it has been proven to treat ALOPECIA ARATA (AA)and ANDROGENETIC ALOPECIA(AGA). In a 2014 animal study, topical application of peppermint oil for 4 weeks showed prominent hair growth effects, increasing dermal thickness and follicle number and follicle depth. Using peppermint essential oil for your hair will make your locks stronger and healthier, without potential side effects. The hydrating, soothing and anti-inflammatory and antiseptic properties of this oil work to nourish your hair naturally. When your glands produce too much oil, it can make your hair greasy even when you just washed it that morning. peppermint oil can help to control sebum production. REDUCE STRESS AND BALANCE HORMONES. Research shows that stress is associated with hair loss and so is a hormonal imbalance.Peppermint is one stop solution for this problem. Simple combine peppermint oil and any carrier oil of your choice and massage the mixture into your scalp. Essential oils for hair can help to boost the health of your hairs in several ways, whether you want to thicken, add shine, hydrate scalp or treat dandruff. Author shireeshaPosted on January 20, 2018 January 22, 2018 Categories BEAUTY, Health, The World Of Essential OilsTags hair, hair loss, peppermint oilLeave a comment on Peppermint oil is more effective than minoxidil! FRANKINCENSE OIL is from the genus boswellia and sourced from the resin of the boswellia carterii that’s commonly grown in Somalia. This tree is different from many others in that it can grow with little soil in dry conditions. The word FRANKINCENSE comes from the term “franc encens”which means quality incense in old French. It has broad range of uses from enhancing the spiritual and meditative practice to use in beauty routines.It has an earthy, uplifting aroma that’s perfect for grounding and spiritual connectedness. Helps reduce stress reaction and negative emotions. Helps boost immune system function and prevent illness. Astringent and can kill harmful germs and bacteria. Heals skin and prevents signs of aging. Acts as a sleep aid. It can be uses as stress-relieving bath soak, natural household cleaner and as an anti aging oil. Sometimes this oil can cause certain reactions which includes minor skin rashes, digestive problems like nausea or stomach ache. Frankincense has blood thinning effects,so anyone who has problems related to blood clotting should not use this oil. 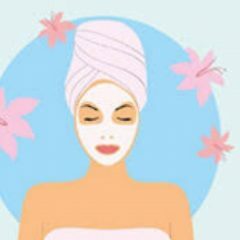 Are you dealing with acne issue? Yes then this is what you should need to know now……. Many millions of people suffer from ACNE. Acne can cause painful and unsightly breakouts on face, chest, back and even arms. When it’s untreated, acne can lead to diminished self-esteem and scarring. Recent studies show that the prevalence of adult female acne has increased. For treating this issue we often use the pathway of chemicals which in-turn can cause adverse health issues. The main cause of acne includes clogged pores ,bacteria, excess oil production and dead skin. Other factors are stress, hormonal condition, certain medications(corticosteroids, androgens, birth control pills and lithium),can also worsen acne. One major study found that TEA TREE OIL was almost six times more effective than the placebo in treating mild to moderate acne. Essential oils for acne have ability to alleviate feelings of stress and anxiety, fight insomnia and sleep deprivation, and balance hormonal level. 1.TEA TREE ESSENTIAL OIL-Anti microbial and antifungal in nature. To use it, add 2-3 drops to a spray bottle with one cup of water and use it as a toner for tightening your pores, Or you can even add 10 drops in your face wash gel for proper cleaning of your face. 3.CLARY SAGE -It contains a special chemical called linalyl acetate which works to reduce inflammation and prevent acne scarring. 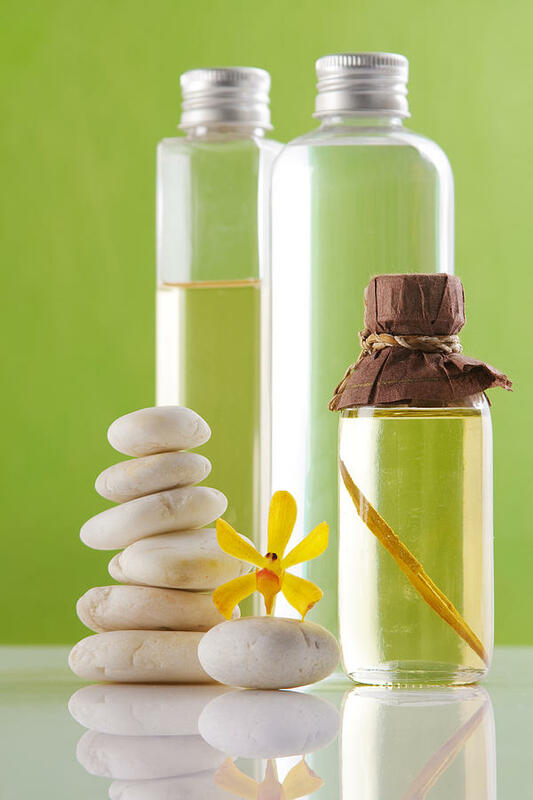 For making a DIY HOMEMADE SKIN OIL you can add 10 drops of clary sage in olive oil/jojoba oil and massage your face . 4.PEPPERMINT ESSENTIAL OIL:-This oil exhibits three key properties in the topical treatment of acne. It is cooling to the skin, inhibits bacterial growth and reduces testosterone 5 alpha reductase production. Aromatherapy is natural and non invasive gift of nature for humans. Its not only the disease symptoms which are eradicated but the whole body is rejuvenated. Essential oils can be a useful non medicinal option or can be combined with conventional care. In the world of cosmetics, essential oil is not a unknown stuff. Lets discuss about the chemistry, essential oil is a concentrated hydrophobic liquid containing volatile aroma compounds from plants. These oils are generally extracted by distillation,solvent extraction,absolute oil extraction,resin tapping and cold pressing. Using essential oils for healing purposes is often called AROMATHERAPY,which is a holistic treatment seeking to improve physical, mental and emotional health. They are often used for relaxation, beauty care, home cleaning and most often used as natural medicine. They are highly concentrated oils that have a strong aroma. To get a picture of how powerful essential oils are consider this example. It requires 1,400,000 handpicked roses to produce a litre of ROSE ESSENTIAL OIL. In Chinese terms,essential oils in general are medicines for the Shen, the spiritual essence that resides in the heart and governs consciousness. In Ayurveda ,they enhance the flow of prana (life form),nourish ojas (nutritional/immunological essence) and brightens tejas (mental luminosity). 1.AROMATHERAPY DIFFUSERS:-Easily available in SearchOnlineandSave and Humongous mall sites. It is the safest way to fill your home or office with essential oil’s fragrance. 4.FACIAL STEM:-Add 1-5 drops of essential oil to a pot of hot water. Cover head with a towel and allow steam to circulate inside the towel. This practice is excellent for opening sinuses, easing tension and invigorating the skin. 5.BATH/SPA:-An aromatic bath is a luxurious way to relax, pamper the skin or feel better when unwell or tired. Add your favorite oil in your bath tub after diluting the oil in carrier oil and feel the heaven and health. A general safe dose is 5-10 drops mixed with 1 cup of salt or emulsifier. 6.COMPRESSES:-Compresses are great way to apply essential oils to bruises, aches and pains or skin problem. Mix 10 drops of essential oil in 4 oz hot water. Soak a clean cloth and wrap the area to be treated. Leave the compress on for 10-20 mins. 2.PEPPERMINT-Support digestion, improves focus, boosts energy, fever reducer, headaches and muscle pain relief. 3.ROSE:-Incredible for reducing skin inflammation and great for creating glowing skin. Add a few drops in your face cream and enjoy the essence of beauty. 4.ROSEMARY:-Can naturally thickens hair so it is great to add to homemade shampoos. Also it improves brain function and memory so it’s great to used when working ,reading or studying. 5.LAVENDER:-Helps with relaxation, improves mood and heal burns and cut. Essential oil can be very useful and beneficial. But one must consult a aroma therapist/doctor before using essential oils for long time. Being a part of alternative medicine, essential oils are widely accepted for their uses in various areas of our life.